The SMOK SPECIES 230W TC Box Mod is a premier high-power vape mod, empowering a new 1.45" OLED Colorful Touch Screen device with sophisticated design element and a powerful chipset for sensational vape experience. The Species 230W Mod is the V2 or second generation of the alien creature, imposing a truly futuristic design with an upscale touch through angular lines and now-iconic cobra resin-dyed panel. 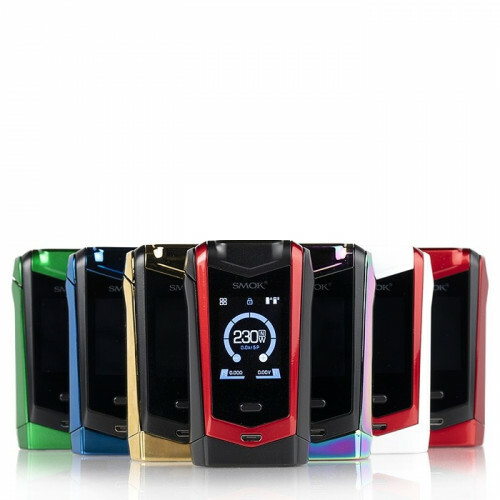 The structure of the SMOK Speciesmaintains an ergonomic, vertical-based design centered around the updated 1.45" OLED Touch Screen with newly interactive features. Maintaining the powerful performance chipset SMOK have come to known for, the Species can fire up to 230W of maximal power with preheat wattage values and full temperature suite such as TCR adjustments.